Raven Gets to Eat Grass! To our delight, Raven is getting ever closer to being a “normal” horse. We have been getting her out on fresh grass little by little to see how her digestive system handles it, and she’s doing well on it. She’s off all medication and now the only additive we give her for digestive needs is a probiotic supplement. We continue to watch her closely for colic signs, but so far so good. She also really seems to enjoy her iFeed automatic feeder and is very comfortable with her routine. When we first took her off of hay completely, she seemed very annoyed when her neighbors were getting hay but she was getting skipped. But now she just waits calmly because she knows that hers will soon be dispensed. Terry has also started Raven back up with groundwork, and with basic things like dealing with fly spray. We had stopped working with her on this while we tried to get her GI tract figured out, but she is back at it and learning quickly! Her personality is sweet and amusing, and she has become a volunteer favorite. She has come far in becoming a well‐adjusted equine citizen, although she is still a baby in some ways. We’d like to send her out for training soon to get her started under saddle, but have a few things to figure out first with logistics on how we would set up a feeder system for her while she’s away. 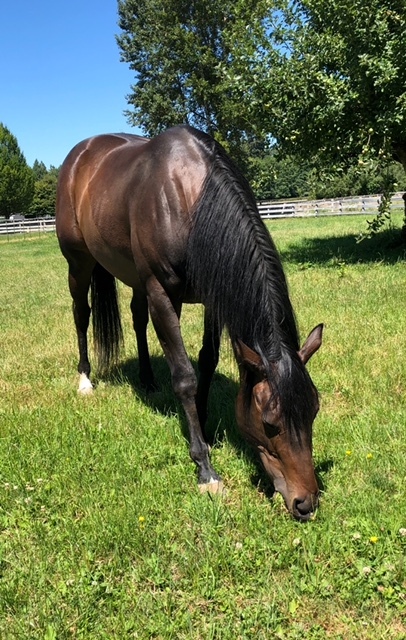 Many thanks to our vet partners at Rainland Farm Equine Clinic and Pilchuck Veterinary Hospital for helping us get Raven farther down the road to wellness, and closer to being able to find her forever home.